For the majority of Americans, going to the dentist is no laughing matter – in fact, an estimated 150 million American adults avoided a dental visit altogether last year. The reason? Anxiety about cost, pain and the extent of dental work they may need. So to raise awareness about the long-term consequences of delaying dental care, Aspen Dental tapped their partner, NASCAR driver Danica Patrick, to give Americans “A Taste of the Future” in a humorous new hidden camera video. 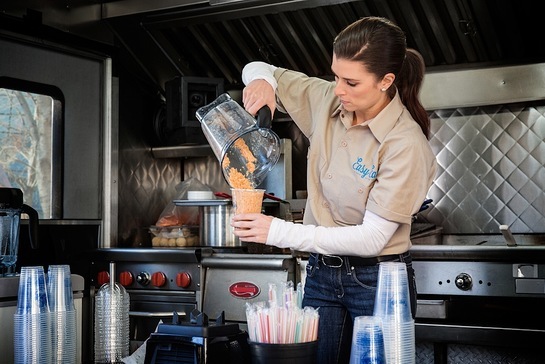 “A Taste of the Future” features Danica Patrick behind the grill of a food truck, going undercover to serve up classic food truck fare like fish tacos, burgers and pulled pork sandwiches. But before handing unsuspecting customers their lunch, Danica does something completely unexpected: She drops their food into a blender, serving it up in smoothie form. Customer reactions ran the gamut from confusion to disgust and were captured on hidden cameras for an arresting look at the potential future consequences of avoiding the dentist. Research shows that for many Americans, dental care has become discretionary, a “nice to do” rather than a “must have.” Case in point: a recent survey of more than 1,000 adults conducted by ORC International and commissioned by Aspen Dental Management, Inc. found that nearly two in five American adults (39 percent) say they have limited or will delay dental care due to their financial situation, a number that has increased by nearly eight percent in the past two years. And they’re making the decision despite knowing the long-term financial implications — 80 percent are aware that postponing or delaying routine visits will cost them more money in the long run. The survey also found that nearly one in five consumers would fix problems with their car ahead of addressing pain in their mouth. The full “A Taste of the Future” video, directed by Hollywood industry veteran Jeff Tremaine, who is widely known for his hidden camera prank television shows like Jackass and feature films such as Bad Grandpa, can be viewed here: www.ATasteoftheFuture.com. This is the latest effort from Aspen Dental to shine a light on the often overlooked dental health care landscape. Last year, Aspen Dental launched the Healthy Mouth Movement to deliver free dental care and oral health education to people in need across the United States. This year, the Healthy Mouth Movement will provide much needed dental care and oral health education to our nation’s veterans, free of charge. As one of the largest networks of dental care providers in the United States, Aspen Dental is stepping in to help raise dental health awareness and to help keep Americans’ mouths on track. For more information, visit www.ATasteoftheFuture.com.